Successful approaches to organizing electronic data generally make liberal use of both top-down and bottom-up design tactics. Primary navigation (driven by top-down thinking) gives us a birds-eye view of the major categories on a website, allowing us to quickly focus on content related to politics, business, entertainment, technology, etc. The “You May Also Like” and “Related Stories” links come from work in the metadata-driven bottom-up space. On the web, this textually mediated blend of top-down and bottom-up is usually pretty successful. This is no surprise: the web is, after all, primarily a textual medium. At its core, HTML is a language for marking up text-based documents. It makes them interpretable by machines (browsers) so they can be served up for human consumption. We’ve accommodated images and sounds in this information ecology by marking them up with tags (either by professional indexers or “folksonomically,” by whomever cares to pitch in). 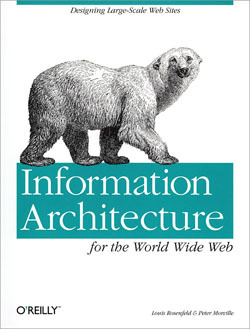 There’s an important point here that often goes without saying: the IA we’ve inherited from the web is textual — it is based on the perception of the world mediated through the technology of writing; herin lies the limitation of the IA we know from the web as we begin to design for the Internet of Things. We don’t often think of writing as “technology,” but inasmuch as technology constitutes the explicit modification of techniques and practices in order to solve a problem, writing definitely fits the bill. Language centers can be pinpointed in the brain — these are areas programmed into our genes that allow us to generate spoken language — but in order to read and write, our brains must create new connections not accounted for in our genetic makeup. In Proust and the Squid, cognitive neuroscientist Maryanne Wolf describes the physical, neurological difference between a reading and writing brain and a pre-literate linguistic brain. Wolf writes that, with the invention of reading “we rearranged the very organization of our brain.” Whereas we learn to speak by being immersed in language, learning to read and write is a painstaking process of instruction, practice, and feedback. Though the two acts are linked by a common practice of language, writing involves a different cognitive process than speaking. It is one that relies on the technology of the written word. This technology is not transmitted through our genes; it is transmitted through our culture. It is important to understand that writing is not simply a translation of speech. This distinction matters because it has profound consequences. Wolf writes that “the new circuits and pathways that the brain fashions in order to read become the foundation for being able to think in different, innovative ways.” As the ability to read becomes widespread, this new capacity for thinking differently, too, becomes widespread. Though writing constitutes a major leap past speech in terms of cognitive process, it shares one very important common trait with spoken language: linearity. Writing, like speech, follows a syntagmatic structure in which meaning is constituted by the flow of elements in order — and in which alternate orders often convey alternate meanings. When it comes to the design of information environments, this linearity is generally a foregone conclusion, a feature of the cognitive landscape which “goes without saying” and is therefore never called into question. Indeed, when we’re dealing primarily with text or text-based media, there is no need to call it into question. In the case of embodied experience in physical space, however, we natively bring to bear a perceptual apparatus which goes well beyond the linear confines of written and spoken language. When we evaluate an event in our physical environment — a room, a person, a meaningful glance — we do so with a system of perception orders of magnitude more sophisticated than linear narrative. JJ Gibson describes this as the perceptual awareness resulting from a “flowing array of stimulation.” When we layer on top of that the non-linear nature of dynamic systems, it quickly becomes apparent that despite the immense gains in cognition brought about by the technology of writing, these advances still only partially equip us to adequately navigate immersive, physical connected environments. Photo: Andy Fitzgerald, of content from Thinking in Systems: A Primer, by Donella Meadows. According to Meadows, we learn to navigate systems by constructing models that approximate a simplified representation of the system’s operation and allow us to navigate it with more or less success. As more and more of our world — our information, our social networks, our devices, and our interactions with all of these — becomes connected, our systems become increasingly difficult (and undesirable) to compartmentalize. They also become less intrinsically reliant on linear textual mediation: our “smart” devices don’t need to translate their messages to each other into English (or French or Japanese) in order to interact. This is both the great challenge and the great potential of the Internet of Things. We’re beginning to interact with our built information environments not only in a classically signified, textual way, but also in a physical-being-operating-in-the-world kind of way. The text remains — and the need to interact with that textual facet with the tools we’ve honed on the web (i.e. traditional IA) remains. But as the information environments we’re tasked with representing become less textual and more embodied, the tools we use to represent them must likewise evolve beyond our current text-based solutions. In order to rise to meet this new context, we’re going to need as many semiotic paths as we can find — or create. And in order to do that, we will have to pay close attention to the cognitive support structures that normally “go without saying” in our conceptual models. This will be hard work. The payoff, however, is potentially revolutionary. The threshold at which we find ourselves is not merely another incremental step in technological advancement. The immersion in dynamic systems that the connected environment foreshadows holds the potential to re-shape the way we think — the way our brains are “wired” — much as reading and writing did. Though mediated by human-made, culturally transmitted technology (e.g. moveable type, or, in this case, Internet protocols), these changes hold the power to affect our core cognitive process, our very capacity to think. What this kind of “system literacy” might look like is as puzzling to me now as reading and writing must have appeared to pre-literate societies. The potential of being able to grasp how our world is connected in its entirety — people, social systems, economies, trade, climate, mobility, marginalization — is both mesmerizing and terrifying. Mesmerizing because it seems almost magical; terrifying because it hints at how unsophisticated and parochial our current perspective must look from such a vantage point. As information architects and interface designers, all of this means that we’re going to have to be nimble and creative in the way we approach design for these environments. We’re going to have to cast out beyond the tools and techniques we’re most comfortable with to find workable solutions to new problems of complexity. We aren’t the only ones working on this, but our role is an important one: engineers and users alike look to us to frame the rhetoric and usability of immersive digital spaces. We’re at a major transition in the way we conceive of putting together information environments. Much like Morville and Rosenfeld in 1998, we’re “to some degree all still making it up as we go along.” I don’t pretend to know what a fully developed information architecture for the Internet of Things might look like, but in the spirit of exploration, I’d like to offer a few pointers that might help nudge us in the right direction — a topic I’ll tackle in my next post.